I’m going to the Capitol tomorrow – to the rally and into the building. It’s clear that our legislators need to meet with us face-to-face. It’s important that they hear us tell them what’s important to us. They need to hear about our budget cuts, the testing, the seemingly endless vacillation on standards. Many also need to hear our gratitude. Since passing HB 2625 adding a parent voice to retention decisions for third grade students, we haven’t had a chance to thank them for quickly and decisively override the governor’s veto. For all the frustration we feel, we have our champions as well. Let them know that you know this. Oklahomans undoubtedly want better schools. But improving student achievement requires far more than vague platitudes and hazy funding plans. Rally organizers should offer a credible, serious plan to improve student outcomes, instead of blanket demands simply to spend more money. If I learned anything from fictional race car driver Ricky Bobby, it’s that you can begin any sentence with the phrase “With all due respect” and have immunity from offending anybody at all. With all due respect, the Oklahoman still doesn’t have a clue about public education. With all due respect, they’re still trying to win last June’s primary. With all due repect, the Oklahoman is one of the main reasons we need to rally in the first place. It was the biggest mass demonstration in state Capitol history, and, sadly, it’s hard to see what it accomplished. Many legislators shook hands with passionate constituents who attended the rally and then voted for the very legislation the ralliers opposed. Time passed and the echoes of the rally died away. The Legislature cut the state income tax and undercut revenue from petroleum taxes, making adequate school funding all the less likely. At the end of the session, education funding only rose 2.1 percent and little of that money made it into classrooms. The Oklahoma PTA with support from the Oklahoma Educational Coalition has called another mass rally for Monday. 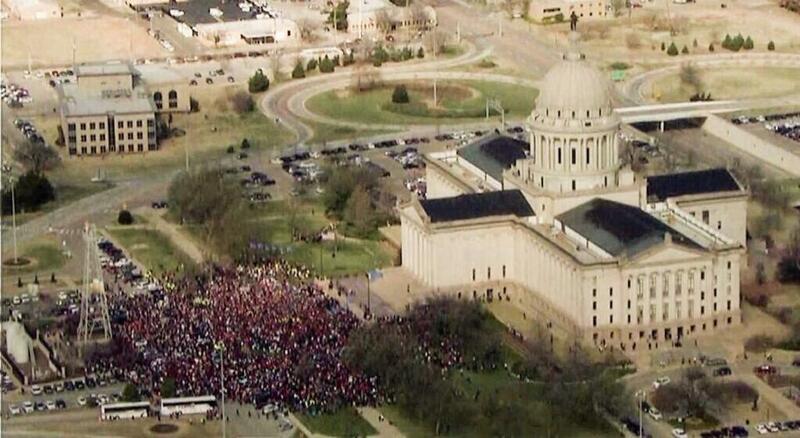 Oklahoma PTA President Jeffrey Corbett has predicted an even more massive turnout — 50,000 supporters. That would truly be an unprecedented achievement, although, frankly, we don’t see it happening. Tulsa Public Schools originally canceled Monday classes, allowing teachers to join the protest. But a severe storm left so many schools without electricity on Thursday that the district had to use its final snow day. Monday’s protest holiday was canceled. Some Tulsa teachers will still be attending, but the news was the latest reason to suspect the 50,000 prediction will be hard to achieve. That doesn’t make the rally’s platform — Our Children Deserve Better — any less reasonable. Its specifics: More money for schools, a moratorium on policies that push high-stakes testing and removal of the sunset provision of last year’s reforms to the Reading Sufficiency Act. Those aren’t radical ideas. State Superintendent Joy Hofmeister, a conservative Republican, has called for a $2,000 teacher pay raise and a two-day extension of the school year. She also has called for reconsideration of the state’s high-stakes testing laws. The changes to the Reading Sufficiency Act was sponsored last year by Rep. Katie Henke, a conservative Republican from Tulsa. She is pushing for making the change permanent. But with a $611 million gap in the state budget, it is difficult to see an increase in education funding. Earlier this month Hofmeister had to argue against a legislative cut in school spending while Senate President Pro Tem Brian Bingman ominously responded that all state agencies should expect funding cuts. Tomorrow is our day to remind legislators of all of this. Yes, there’s a $611 million dollar hole, but whose fault is that? I know it’s foolish to bite the hand that feeds you, but the hand seems reluctant. We’re not showing up to bite, but we do expect our elected leaders to listen, answer questions, and ask questions of their own. Public school teachers are struggling to teach more students under more mandates with bigger class sizes and fewer resources than they were seven years ago. Yes, the legislature found $40 million to put back into the funding formula last year, but as Oklahoma approaches 700,000 public school students, that doesn’t get us very far. To the extent that districts are still buying textbooks and technology, they’re using locally-generated bond revenue to do it. The exodus of teachers is alarming and unprecedented, yet not surprising. Given how our teachers endure low compensation, poor morale and burdensome mandates, perhaps the bigger surprise is that so many of them choose to stay in Oklahoma classrooms. They do so because teaching is a calling they don’t want to abandon. But even the most selfless teachers need to know Oklahomans appreciate their worth. The average teacher pay in our state is $44,373 — about $3,000 below the regional average and $10,000 below the national average. The average starting teacher salary here is less than $32,000, hardly an incentive for a recent college graduate when they can move elsewhere and earn more. Such obstacles don’t minimize all that Gov. Mary Fallin and the Legislature have done to protect education funding in recent years. Indeed, the state Department of Education has received $150 million in new monies since fiscal year 2014. While many state agencies endured slashed budgets after the 2008 recession, schools have received increases since fiscal year 2011 mostly to keep up with health care. When school leaders, teachers and parents rally at the Capitol on Monday, it’s important that lawmakers receive the thanks they deserve. Below, I have created a table showing Oklahoma’s historical average salary for each of the years in the NCES dataset. The figures included represent actual dollars. As you can see, 45 years ago, Oklahoma teachers made 79.8% what teachers around the nation made. Two years ago, our state’s teachers made 79.7% what teachers around the country made. Basically, we have a long-standing tradition of paying about 4/5 of what teachers make nationally. The NCES dataset also looked at the salaries with each value set to 2012-13 dollars based on the Consumer Price Index. Relative to the overall economy, I guess Oklahoma’s teachers are about in the same place they were 45 years ago. In 2009-10, however, teachers were having a pretty good year. This is what we need to aim for. This has always been a problem, but prior to 2010, we were on our way to improving our placement. This rally is also about the places we live. As we do every year, this year we have a push for school consolidation. Although I work for a large school district, I have also worked for a small, rural one. I see the value of both. Consolidation of small districts has brought minimal savings to states that have forced the issue. Every year, though, a community or two decides that it can no longer support the district to consolidate on its own. This is what we need to continue doing. Finally, if you need more rallying points, check out this list of goals, facts, and solutions from the state’s largest parent group – the PTA. Rally for Students. For Teachers. For Schools. For Communities. I made a few obnoxious signs. I’m not bringing them. I just needed to get it out. One of them was “GOP wants smaller government, yet micro-manages and oppresses public education”. Yeah. I said it. I’m going without a sign, just to show my support for my students. This legislative body seems to be in full support of charter and private schools over public ed, which is elitist and further balloons the gap between the rich and the poor. I’ll be there…respectfully. I’m going to the capitol today. This blogger has done more to out our state government’s policies on education than anyone else. I’ll blog about my experience later today.